Looking for a professional finish to your painting jobs? There are many paint sprayers on the market, so it is important that you spend time evaluating the features of each. Then, you’ll be able to tell if a particular sprayer is right for your tasks. Let’s take a closer look at the Earlex HV 5500 Spray Station Review and see if this will work for your small to medium range jobs. What Paint Jobs Can The Earlex HV5500 Spray? 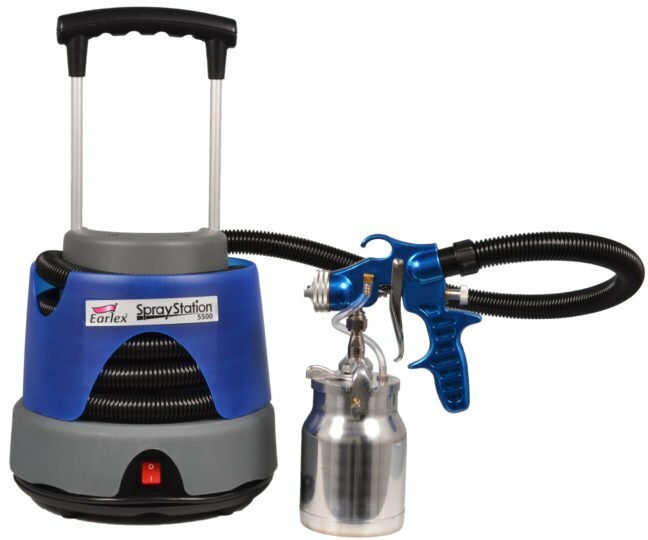 How Does This Machine Compare to Similar Paint Sprayers? Is The Earlex HV5500 A Worth The Money? The Earlex HV5500 Spray Station comes complete with a professional metal spray gun and a powerful 650-watt turbine. This allows you to provide a superior finish on a wide variety of projects. The professional spray gun also includes a fast push-n-click three position external spray pattern changing system. This offers fan widths ranging from 1-inch to 12-inches. To alter the spray pattern from vertical to horizontal or round, you can simply “push and click” the adjustment. You don’t have to worry about fiddling around with any knobs to make the adjustments you need. Instead, you can alter the finish from the Earlex HV5500 Spray Station with ease. Superior power and airflow provide optimum atomization. Easy adjustments for three external spray patterns. 1-Quart Teflon layered container allows for easy setup and cleanup. Includes a 2.00mm spray needle. Can be used upward and downward. Comes complete with a storage system along with a 5.5-foot power cable and 13-foot air hose pipe. The Earlex HV Spray Station is a great entry-level system. It is a powerful HVLP, a semi-professional unit that is best suited for small to medium-sized jobs. It can easily spray thinned latex, lacquers, stains, sealers, oils, varnishes, urethanes, shellacs, enamels, and acrylics. You’ll find that it is useful both inside and outdoors on a multitude of projects. It would be ideal for use by an entry-level contractor, woodworker or automotive enthusiast. The portability of the system makes it best suited for taking on any job site. It has been used on exterior trim, shutters, doors and other projects with great reviews. If you have larger jobs to tackle, especially if you need to use higher viscosity liquids, you might be interested in learning more about the Earlex HV6900 with the more powerful turbine. The Earlex HV5500 Spray Station comes with a 650-watt turbine motor that features an air flow of 42 CFM. The pressure rating of the station is 2.2 PSI. This provides a super atomization of the liquid finish allowing you to accomplish a smoother, finished surface. The biggest difference with this unit compared to other comparable models is that you don’t have to fumble with knobs or dials to make adjustments. Instead, simply push a button to change the pattern adjustment. That is a nice feature when you are busy painting. The manufacturer provides a 2-year warranty. This is more than most other manufacturers that only offer a 1-year guarantee. If you find that this spray station isn’t powerful enough, you could always look at the next stage up with the Earlex HV6900. That offers a 3-stage turbine instead. It also provides 71 CFM which is almost twice as much as the HV5500. Obviously, the price goes up relative to its features. There is no doubt in my mind that the Earlex HV5500 Spray Station offers a great value for the money. It is lower priced compared to other highly rated HVLP sprayers and will cut down a lot of time on painting projects. The unique push-button control also makes this a valuable tool when trying to adjust your painting pattern. It is an option that isn’t available on most sprayers. Many of the reviews for the Spray Station concluded that it was a well-built piece of equipment for the money spent. Even after taking on many job sites, it still holds up and does a great job years after the purchase. The important thing to keep in mind with this sprayer is that it isn’t designed for large projects. You would only want to move forward with this particular model if you are planning small to medium sized jobs. The turbine on the unit is built into the base. This also contains a 13-foot long hose and holder for the quart size Teflon spray gun. The bleeder-style gun will offer a continuous flow of air during projects. You can also fit the gun with tips ranging in sizes 1.5mm, 2.0mm and 2.5mm so you can spray a variety of finishes. You’ll also receive a viscosity cup to make your job even easier. The HV5500 is capable of spraying multiple patterns based on how you position the air cap. The horizontal and vertical spray patterns are perpendicular to the air cap and the circular position is at 45-degrees. The portability of the unit makes it ideal for taking anywhere. It also doesn’t require the use of an external air compressor like some units will. It has an easy setup and cleanup making it ideal for a new user. This spray station isn’t designed to take on larger projects. It will only work properly when used on the smaller to medium-sized tasks. You will have to thin some of your higher viscosity materials to get them working properly. As long as you follow the directions, this shouldn’t be an issue for you. The 2.0mm spray needle is best for applying mainly primers and paints. If you plan on working with other materials, you’ll probably want to look at using a different size tip to achieve your desired look. The Earlex HV5500 Spray Station is a great option compared to the higher-priced models available. If you are looking to complete your small to medium-sized household projects with a sprayer, this is a great choice. You’ll save time over using the paintbrushes or rollers, plus you can have an easy setup and cleanup with this unit. Overall, the Earlex is a great machine for entry-level users.